Getting a pay raise while sitting on the couch? Sign me up! Thanks Realty Income for year another raise! The Board of Directors at Realty Income (O) are at it again giving investors yet another dividend increase. 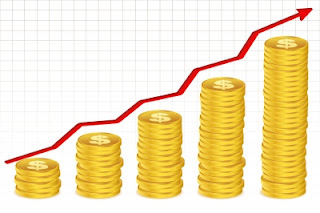 The monthly dividend payment has increased to $0.1995 from $0.199. 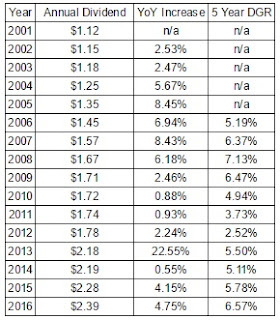 This is the 86th dividend increase from Realty Income since 1994. Realty Income is also on the verge of reaching a very distinguished title of Dividend Champion with an annual dividend growth streak of 23 consecutive years. Shares currently yield 3.75%. That might not seem like much of a raise at just 0.25%, but this is also the 3rd dividend increase this year alone. Compared to the dividend announced in June 2015 it's actually a solid 5.0% increase. Since I own 91.685 shares of Realty Income in my FI Portfolio this raise increased my forward 12-month dividends by $0.55. This is the 4th dividend increase, on an annual basis, I've received from Realty Income since initiating a position in 2013. The cumulative dividend increases over that time have amounted to 9.9%! According to USInflationCalculator the total rate of inflation over the same time period is just 2.7% so Realty Income is increasing my income much faster than the negative drag of inflation. The price of Realty Income shares has increased rather dramatically over the last 12 months as investors have been seeking out safety and income. This has pushed the dividend yield down below 4.0% which is a bit low for my liking. That's taken a lot of the value proposition away from Realty Income; however, the shares do appear to still hold some potential based on the Gordon Growth Model. 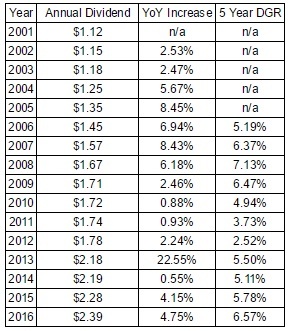 The following table shows the required dividend growth rates in order to provide varying annual growth rates. Based on just the Gordon Growth Model as well as Realty Income's strong management 4-6% annualized dividend growth looks very attainable. With dividend growth in that range the annualized return on the shares would come in between 8-10% which is pretty solid in my book considering the stable nature of their business. It's at least worth taking a closer look, despite looking expensive on the surface. My forward dividends increased by $0.55 with me doing nothing. That's right, absolutely nothing to contribute to their operations. Based on my portfolio's current yield of 3.02% this raise is like I invested an extra $18 in capital. Except that I didn't! One of the companies I own just decided to send more cash my way. That's how you can eventually reach the crossover point where your dividends received exceed your expenses. That's DIVIDEND GROWTH INVESTING AT WORK! The beauty of the dividend growth investing strategy is that you build up your dividends through fresh capital investment as well dividend increases from the companies you own. For a dividend growth investor there's not much that's better than hearing news of a dividend increase. So far this year I've received 25 increases from 22 companies increasing my forward 12-month dividends by $133.01. My FI Portfolio's forward-12 month dividends increased to at $5,573.94 and including my Loyal3 portfolio's forward dividends of $63.88 brings my total taxable account forward dividends to $5,637.82. Do you own shares of Realty Income in your own portfolio? Does Realty Income still look compelling as an investment with a starting yield below 4%?